A planner, no matter how beautiful, won’t be much help if it isn’t set up so you can make every day your best day. 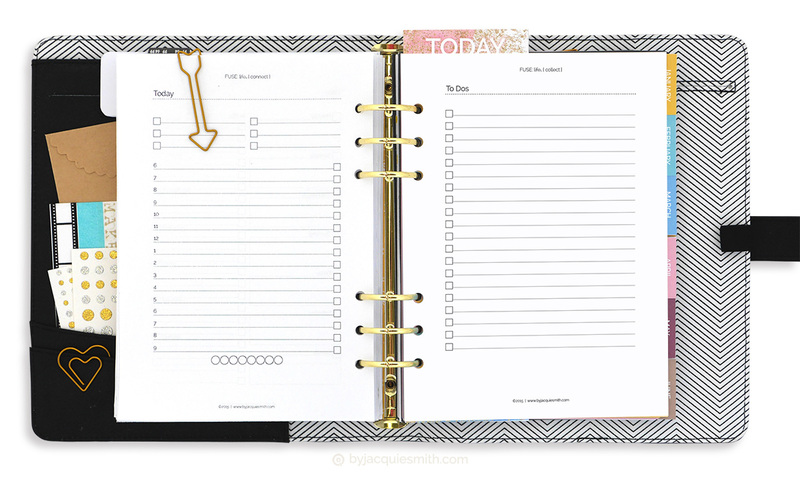 How to create and print a custom planner … easy! With a bundle of individual printable planner pdf files it is easy to create your own custom planner. To be able to organise your pages, is to design your day your way. Now that’s planner freedom! 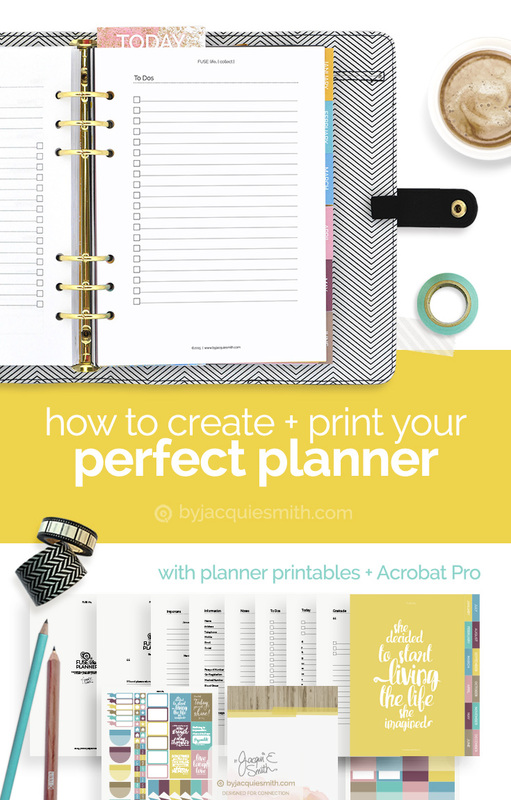 The easiest + quickest way to make your own planner and print double sided, whether they are dated planner pages or pages that need to be in a specific order, is to create a single pdf document from your bundle of individual pdf planner pages. We are going to create your perfect planner using the pro version of Adobe Acrobat and the FUSE:life Core Planner Kit : medium size. # Tip: This printable planner kit is perfect for those who thrive on a single day page + to do lists. 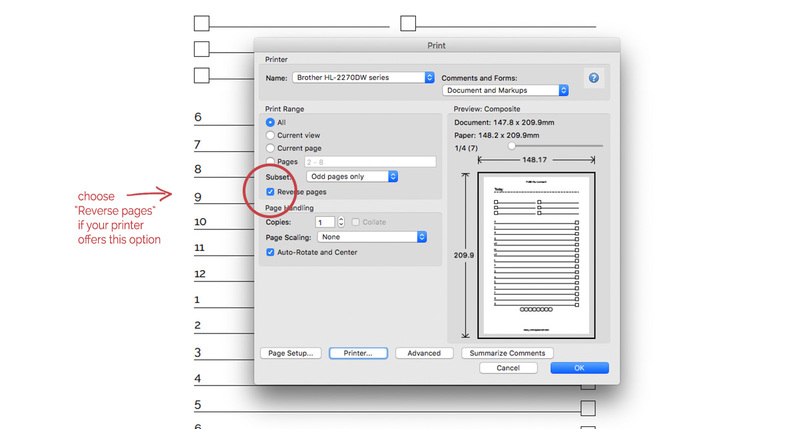 The instructions I’m sharing today are for printing single page pdf files on the corresponding paper size. This is the easiest way to set up your custom planner. For more information about choosing planner and paper sizes, see my Printing Planner Pages in 3 Simple Steps article. Let’s get started and create your custom planner document for printing double sided. With Adobe Acrobat Pro, open the first file of your printable planner pdfs and choose “File > Save As” (to save a copy) + rename it. This will be the document we will use to create our custom planner. I’m starting with the “Belongs” pdf and name my file “Jacqui 2016 Planner“. From the Tools panel, click “Insert from File“, navigate to find your next page file, for me that is “Important 1″, select it and choose “after last page“to insert the page into your document. 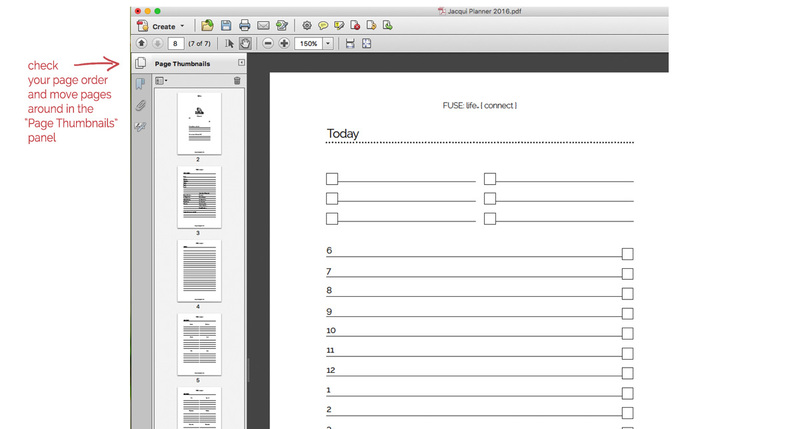 Continue adding page files in the desired order to create your perfect planner. 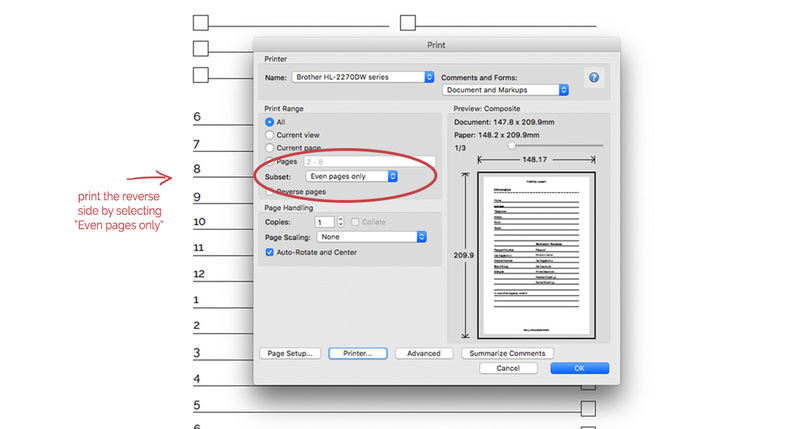 You can add multiple copies of the one pdf in your document. If you decide to change things around, no worries, we can do that after the pages are inserted. We will take a look at that next. With the Page Thumbnails panel open, you simply click on the page you want to move and drag it between the pages where you want it to go. Note: Ensure you have an even number of pages in your file to print double sided on each page. If you have an odd number of pages your last page will be blank on the reverse side. 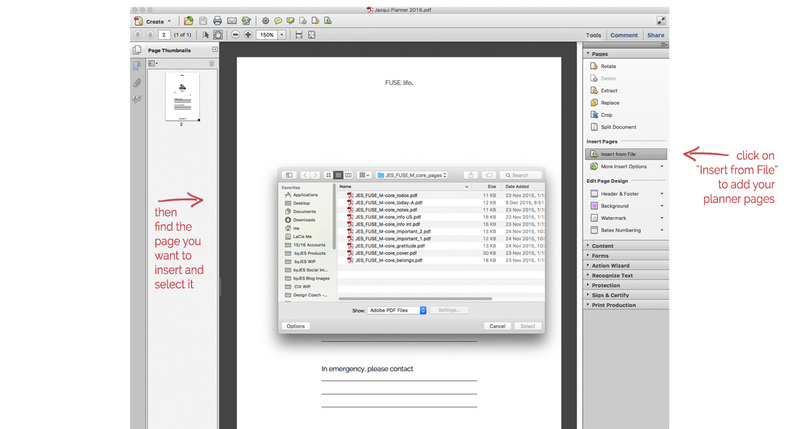 #Tip: Save your pdf file often as you work! 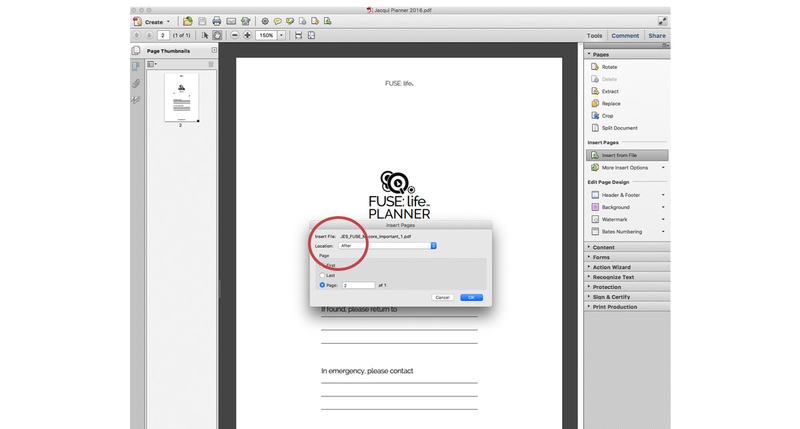 With your custom planner pdf document created, you are now ready to print. #Tip: If you prefer not to print the planner pages yourself, you can take the pdf file you created to your local copy shop and have them print ir for you. They can also bind it or you can take it home, hole punch the pages and insert it into your favourite planner binder. Ensure your printer has the correct size paper in the paper tray. With your custom planner document open, we will print the odd pages of your planner first. Make sure you select your paper size. Option 1: Insert the pages in the order as printed into your printer and print the odd pages in reverse order. Option 2: If your printer doesn’t allow you to reverse order print, you can reverse the order of the odd planner pages, one by one. Simply take the top sheet and set it aside to create a new pile, then take the next sheet and set it on top of the new pile, until all pages are in the new pile, in reversed order from when they were first printed. Now that we have the first side of our planner pages printed, we are ready to print on the reverse side. For tips on how to work this out, check out my Tips for Printing article. 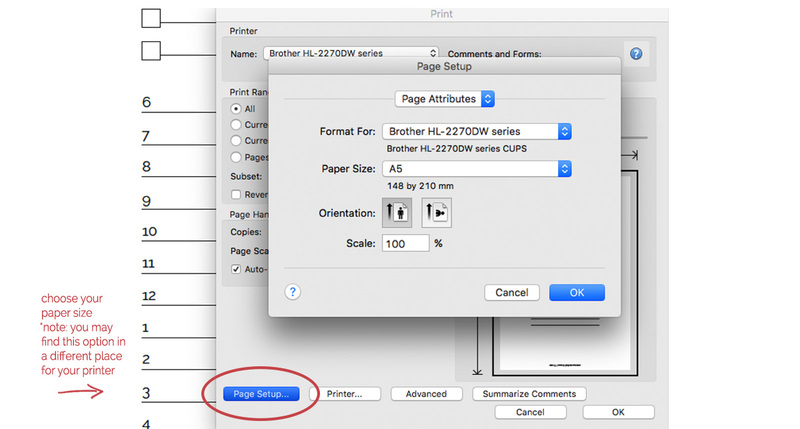 Insert the pages into your printer and print the even pages. Trim your pages if needed, hole punch + insert into your favourite binder. Now you are ready for an awesome + productive day ahead!